Around the classic 1800's Western campfire, Slope and Tar tangle about what's been, what will be, and who may or may not survive the first New Age chat in the Old West. All else aside I found her more credible as a journalist (the actress in the feature was more the "schoolgirl", which may have been intentional); Ringwald's performance did more to make me wonder at the end of the film just what she would write for her paper. Would that have been a distraction as we watched Carl's re-entry? I don't recall any followup to that in the feature. Altogether this was fascinating, not to be compared head-to-head with the full-length film which has justly become an American classic. 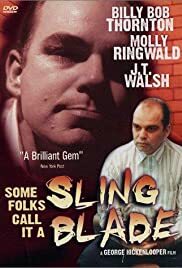 Films like "Sling Blade" can stand with the best of what is often considered superior European cinema.